Ok so we got a little fancy in the kitchen with pork fillet. “Piccata” means sliced but sliced pork sounds boring right? So we zhooshed it up in a #JustDelicious Italian way. Cook the linguine according to the package instructions, drain and set aside. Heat the oil in a large frying pan, add half the butter and then the pork fillet pieces and fry until golden, basting occasionally with the creamy peri peri sauce from the packet. Remove the pork from the pan and set aside, keeping the pan drippings. Add the wine to the pan, bring to a simmer, scraping all the bits off the bottom of the pan. Add the stock, garlic and lemon juice and cook until the sauce has reduced slightly and thickened. Whisk in the remaining butter, season with the salt and pepper and add the parsley. Return the pork to the pan and cook for 1-2 more minutes to heat through and coat in the sauce. Add the linguine to the pan and toss to coat in the sauce. 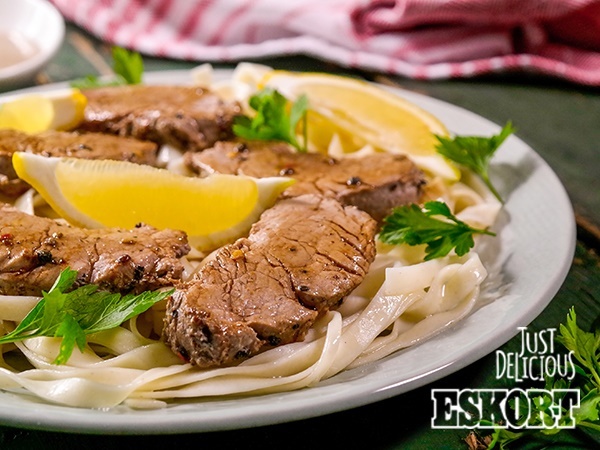 Place the linguine on dinner plates and serve topped with the pork and garnished with extra parsley and lemon wedges.